Air conditioning is a very expensive cooling choice. It is expensive to both install and run as well as being unreliable which adds to the maintenance costs. Ceiling fans on the other hand offer a very low cost-effective alternative which will save 90-95% of the capital and running costs. 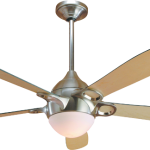 Instead of taking thousands of watts of power a ceiling fan can run on as low as 5w. Using or switching to one will save valuable energy and help reduce harmful carbon emissions. 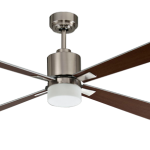 A ceiling fan will typically use the energy of a 60 watt light bulb although some of the latest DC fans consume a very small amount of power eg just 5 watts. The low power consumption means that money is saved on the installation and wiring too. Because there is virtually nothing to go wrong the maintenance costs are non-existent. Not only that but they are extremely reliable since the only moving part is the motor. This is welcome news to facilities and building managers who break into a sweat every year at the arrival of the first heatwave as they know that the air-conditioning system will more likely than not fail to work properly. Furthermore they know that getting an engineer around to fix it will be impossible due to every other office having exactly the same problem! To try and avoid this means taking out expensive maintenance contracts. 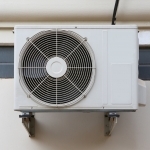 Even with these it can still take weeks for an air-conditioning system to be properly sorted. The issue is aggravated by being in a region where the air-conditioning is only turned on and used for a few months during the year. It really is an expensive luxury that adds a lot of hassle and costs to the office overhead. Compare the cost savings in the graphs below which are based on typical installations. We also show how you can make big savings on running costs by combining a ceiling fan with an existing air-conditioning system. This is because the temperature can be notched up 3-4 degrees to allow for the cooling effect of moving air. 1. 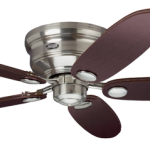 Health issues – There is no danger of catching legionnaire’s disease if you use a ceiling fan. Also there is no danger of incubating and recirculating contagious bacteria and viruses which air-conditioning systems are renowned for. Finally, you avoid the nasty dry air which makes your eyes itchy, tearful and uncomfortable – not something you really want your employees to have to deal with when they are meant to be working! 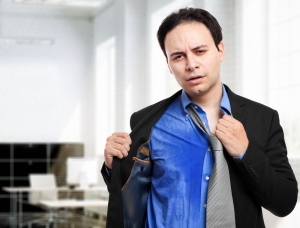 Who knows how many days off sick are generated by the use of air-conditioning in offices? Ceiling fans really are the healthy option. 2. Avoids expensive and noisy desk fans – Once the first heatwave hits and the air-conditioning fails to operate there is no alternative but to switch into an emergency response. This normally takes the form of expensive and noisy desk fans. Expensive because they move hardly any air so everyone needs one, plus they have a habit of “disappearing” out of the office when no one is looking or at the next office move or clearout. 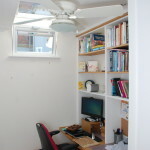 Ceiling fans gently stir the air and do not create the annoying loud noices of desk fans. Even bigger pedestal fans become junk and clutter once the heatwave has passed. Other’s get the portable air-conditioning units but don’t set them up properly. Three years ago I visited a branch of Marks and Spencer who had a load of these units set up in the store with the hot extracted air simply exhausted back into the store. So they were actually heating up their store without realising it since all the energy used ended up in the air!!! 3. Move comfortable all the year round – Whereas air-conditioning can only be put to any use for a few hot weeks in the middle of summer a ceiling fan can add comfort and cost savings all the year round. 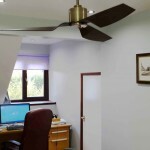 In the less hot spring and autumn when an office can still be very hot from computers and screens a ceiling fan can cheaply help circulate fresh cool air from outside through open windows. A more comfortable work force is a more productive one! 4. 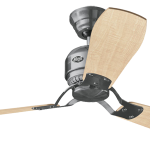 Winter heat circulation – In the middle of winter a ceiling fan continues to reap savings by running in reverse it can bring hot air down from the ceiling to the floor level. This can enable the thermostat to be turned down by 3-4 degrees saving yet more energy and money. 5. Green credentials – The energy savings are substantial and will enable office tenants to genuinely wave the green energy saving flag. It can be seen that the case for using ceiling fans instead of air-conditioning is overwhelming. Especially since in our temperate climate where air-conditioning really is overkill as it rarely gets hot enough to truly justify it’s use. Maybe for a few days or at most a few weeks in the peak of the summer – but is it really worth all these financial, health and productivity costs?